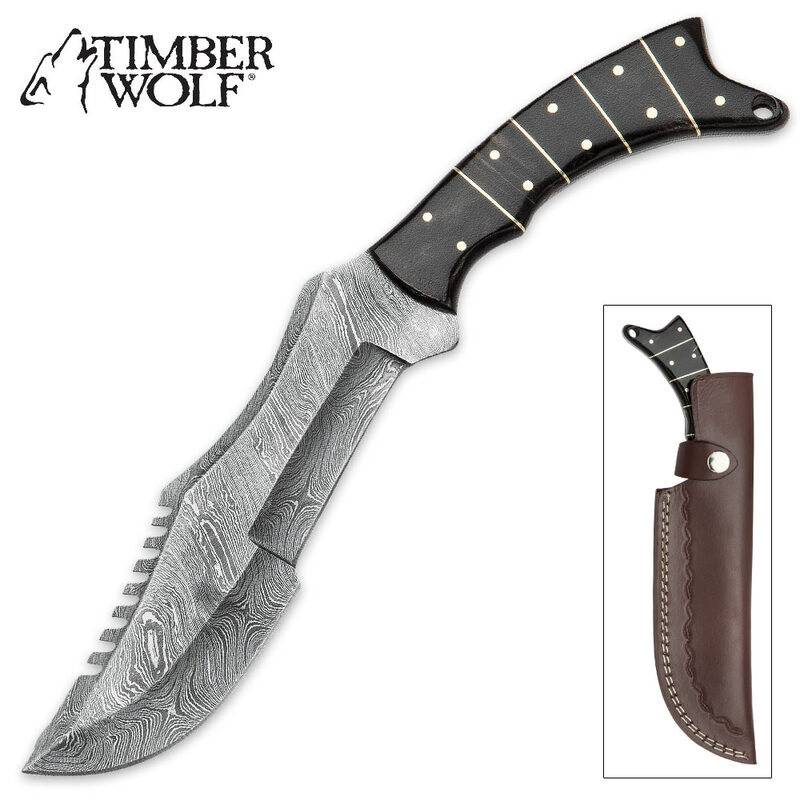 Timber Wolf Buffalo Horn Damascus Steel Bowie Knife w/ Leather Sheath | BUDK.com - Knives & Swords At The Lowest Prices! Timber Wolf’s new Buffalo Horn Damascus Bowie combines natural beauty, time-tested steel, meticulous attention to detail, exceptional balance and feel, and raw cutting power. 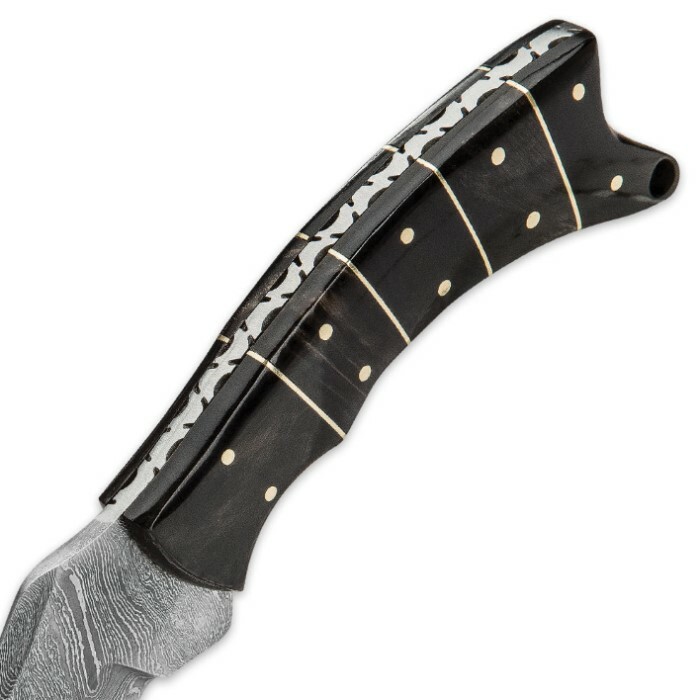 It boasts a stunning 6 3/4” Damascus steel blade and gently curving natural buffalo horn handle. The gracefully contrasting folds in the hand-hammered Damascus steel glint and gleam under light, highlighting the distinctive blade’s unique shape and accents. The Buffalo Horn Damascus Bowie is much more than a pretty face, however. With its razor sharp, hand-honed edge and careful, quality craftsmanship, this full tang beast of a bowie effortlessly slices and cleaves its way through even the toughest cutting jobs - field dressing, skinning, cutting branches and much more. 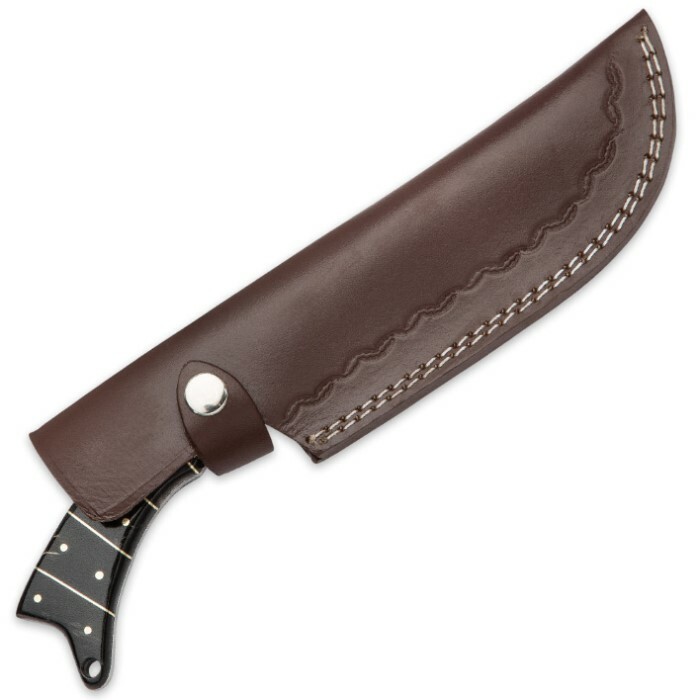 Its impeccable weight distribution and ergonomic handle design gives the Buffalo Horn Bowie a balanced, solid feel that makes it a pleasure to wield for even hours at a time. Built to last and protected by the included genuine leather sheath, with proper care the Buffalo Horn Bowie can be your go-to fixed-blade for a lifetime and beyond, making it an outstanding family heirloom. Wield the Buffalo Horn Damascus Bowie once, and you’ll immediately fall in love; you’ve just got to experience it for yourself! Thankfully, bringing home this striking work of bladesmith artistry is easy and painless with our unbeatable prices! Supply is limited, so order today!